Pierre Louis Loubet in action in 2018. The competition in this year’s WRC2 championship has stepped up a notch after front-running contenders Kajetan Kajetanowicz and Pierre Louis Loubet committed to the category. Kajetanowicz, from Poland, is a three-time European champion (2015 – 2017). He tackled a handful of WRC 2 rounds last year, but is taking the step up to a full seven-round programme in 2019. As well as learning a number of new events this year, the 39-year-old will be getting used to a new Volkswagen Polo GTi R5 run by Austria’s BRR team, having switched from the Ford Fiesta R5 he has campaigned since 2014. 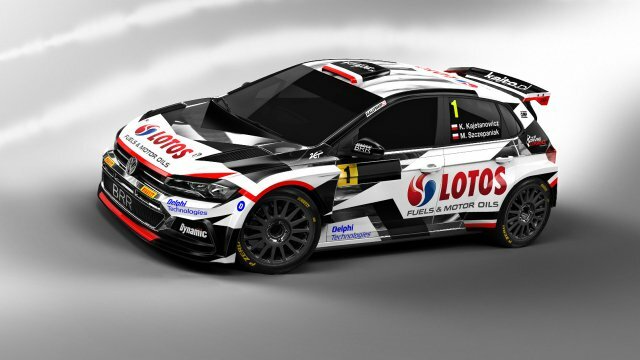 The livery of Kajetanowicz’s new car. Alongside co-driver Maciej Szczepaniak, Kajetanowicz’s programme will begin at Corsica Linea – Tour de Corse (28 – 31 March). The remaining rounds have not been confirmed. Loubet, who hails from Corsica, will also get his campaign underway at Tour de Corse. Aged just 22, Loubet returns for a fifth season of World Championship competition. He made his debut in the Junior WRC in 2015 and followed this with three seasons in WRC 2. After rallying R5 cars from Citroën, Ford and most recently Hyundai, Loubet will drive a Skoda Fabia R5 from 2C Competition in 2019, accompanied by long-time co-driver Vincent Landais. As well as Corsica, the duo will tackle the rounds in Portugal, Italy, Finland, Germany, GB and Spain.